Wireless earbuds have always been a little hit or miss. Sometimes they sound good, but look ugly. Sometimes they’re comfortable, but not portable. Sometimes you can find headsets that are perfect for runners, but aren’t perfect for people who just want to commute home from work. Striking the right balance while also dodging crappy headsets can be tough. But in a lot of ways, it’s actually getting a bit easier. We don’t often think of earbud technology as improving in the way that display resolutions for devices like TVs have been improving. But earbuds really have been getting a little better with each generation. You can build earbuds in a thousand different ways. Some are better than others, some are just different. In a number of ways, xFyro Aria Wireless Earbuds are distinctly better than similar audio equipment. These earbuds are some of the most portable on the market right now, and with one of the smallest and most compact charging cases, too. From a technical standpoint, xFyro Aria was made alongside some of the best consumer-grade technologies you can pack into earbuds at the present moment. That includes modern wireless technologies like Bluetooth 5, a higher-end waterproofing certification, an almost best-in-class battery lifespan, and a number of common sense features that really help round things out. Of course, that does not include audiophile equipment. 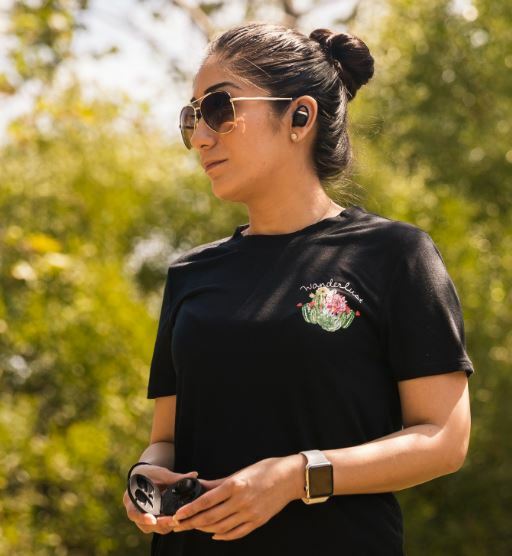 But assuming you’re not willing to shell out hundreds for earbuds, which is probably a good idea given the relatively short-lived nature of these devices, Aria Wireless Earbuds represent a smart point of entry for wireless earbuds. It’s a point where you’re investing a reasonable amount into features, but you’re never losing sight of value. Not right for everyone, but certainly attractive to a lot of people. These earbuds don’t look particularly special. The shape of each earbud is slightly unusual; they look a bit cone-shaped. Beyond that, their black matte surface could easily be confused with hundreds or thousands of different earbuds. 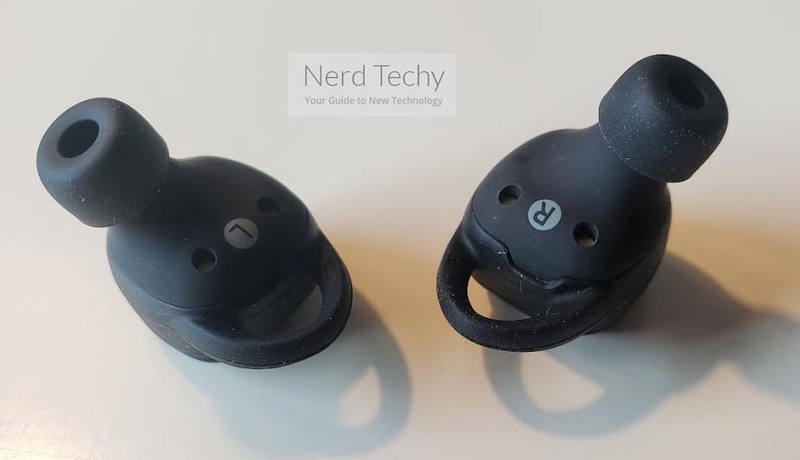 However, if you pay close attention, you’ll find there are actually some significant differences between these earbuds and your typical pair. The outside is fitted with a magnetic casing to help ensure your earbuds never have the chance to fall out or otherwise get lost from position. This design actually contributes to the optimization of their battery capacity, and it eliminates any need for unnecessary buttons or other interactions. No springs, buttons, no messes. 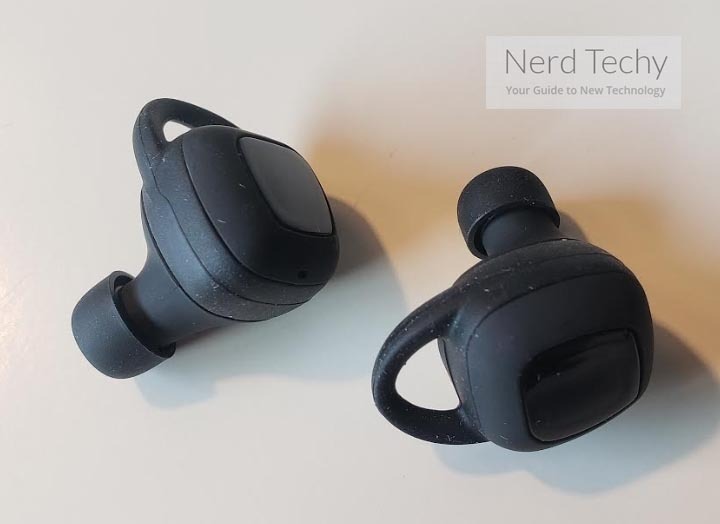 The outside of each earbud is partially constructed from ABS plastic, and partially constructed with a smart looking aluminum shell that’s been polished to match the matte finish of the ABS. It’s generally a high quality design that’s ready to endure minor impacts, resist scrapes, and stay together in the process. The base of the earbuds also provides a nice gripping space that can be used to add or remove the different ear-tips currently attached, which is often a difficult process without a design like this. And that construction allows Aria earbuds to enjoy an IP67 waterproofing certification. You could technically submerge these earbuds underwater, though you’d want to keep it to a couple of feet, and not for an indefinite period of time. But still, provided you don’t plan on going for a swim with these earbuds, that should provide you with all that you need. The case measures 6.25 x 1.0 x .75″ inches, a pretty compact design. It basically looks like some type of large pen. But apart from the slightly unusual form factor, this is actually a fairly ordinary case. Along the sides you’ll find a dual charging interface with both micro USB and USB ports. Pretty intuitive stuff. Why did they use such an odd shape for the case? Well, it actually has to do with maximizing space. If you looked at the blueprints for this design, you’d find virtually no empty space or wasted materials. For better or worse, this is about as compact as you can possibly make a pair of earbuds while using a charging case. Many different earbuds end up sounding pretty similar. Because most of them are using the same essential technologies, or using small variations of very similar technologies. They also share many of the same limitations. So people who end up deciding which earbuds to pick based on appearances alone aren’t being totally ridiculous, especially if they’re shopping well-outside of the audiophile price range. In that regard, xFyro Aria Wireless Earbuds sound fairly typical for this price range. There are a couple of things that help highlight their sound as opposed to similar headsets. Out of the box, these earbuds have pretty powerful bass. Mid-highs are also particularly strong, which really helps to boost vocals. The higher end of the treble range isn’t particularly well represented, though that’s something that’s not terribly uncommon for earbuds. You can level out that part of the sound with an equalizer, or otherwise draw back the bass levels to normality, should your tastes require it. Unfortunately, xFyro Aria doesn’t provide you with an equalizer, or sound profiles you can move between. But frankly, not many people actually use those types of features, and you can download an equalizer app in about two minutes, so these are minor complaints. 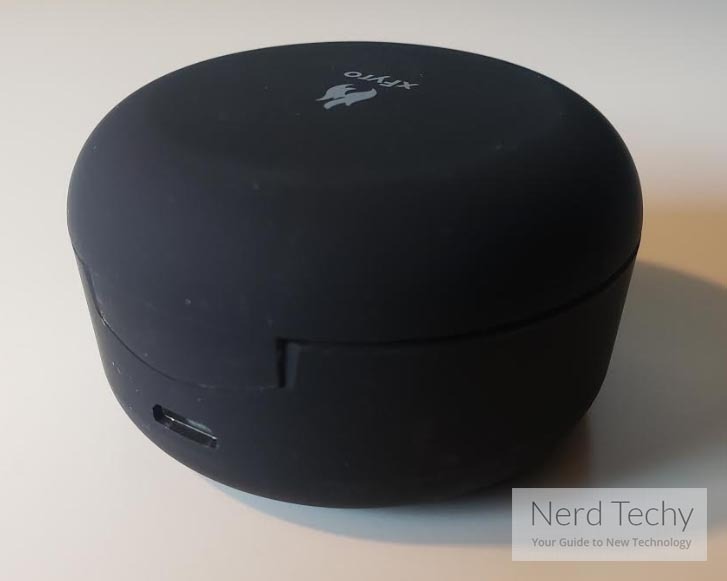 Using such an incredibly compact case, these earbuds rely a modestly sized 850mAh power bank. 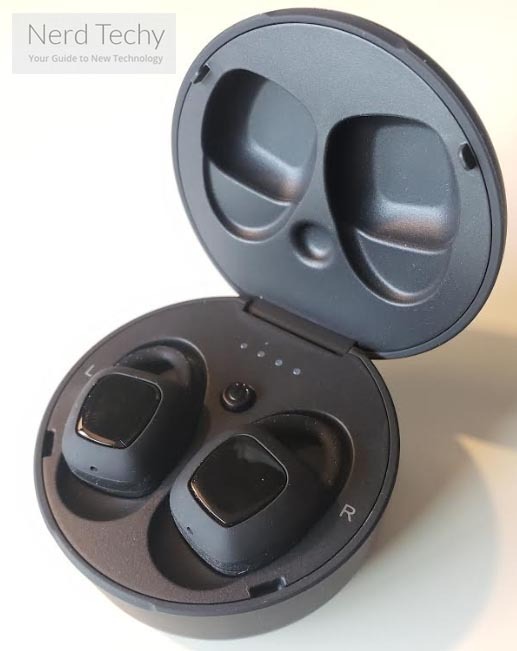 That’s actually pretty close to half as large as some of the charging cases out there, which means battery life is probably not the greatest strength of the Aria Wireless Earbuds. However, it’s not a great weakness, either. 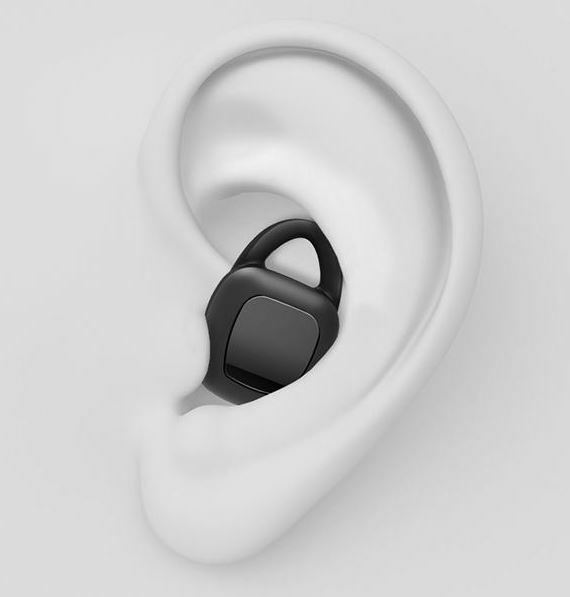 Independent from their case, these earbuds should be able to provide about 8-hours of music/talk time. That’s actually much higher than most true wireless earbuds like these. Once the battery inside the case has been accounted for, you can get about 20-30 hours of playtime out of these earbuds. The variance between getting 20-hours or 30-hours really depends on how loudly you end up listening to your music, how often you take calls, and so on. If you’re someone who takes a lot of calls, you’ll probably find that you end up getting closer to the 30-hour mark. If you’re someone who takes not many calls and prefers to listen to their music near maximum volume, you might end up getting closer to the 20-hour estimate. Even though 8-hours from each bud is pretty high, the 30-hour total a little low. Some similarly priced headsets are capable of literally doubling or tripling that number. But again, those headsets eventually end up suffering in other areas. If you can live with 20 or 30 hours of playtime, you’ll find the rest of the battery’s design lives up to higher expectations. It takes about two hours to charge, assuming you’re using the included charging cable and charging up from an adequately powerful source. And standby time works out to be around 300 hours. Not bad at all. These earbuds include a pretty standard array of ear tips, including two sets in three sixes. Interestingly, there’s actually some real noticeable difference between these sizes. Many earbuds only include marginally steps between each size, whereas here you’ll find rather distinctly small, medium, or large buds. People who’ve had issues with finding the right size in the past may have better luck here. Unfortunately, this kit does not include any memory foam ear tips. Those are an increasingly popular type that can provide a little extra passive noise protection. But the included tips are reasonably good at blocking nose, as least as far as silicone ear tips go. Not many people want to have to switch between different types of ear tips, anyway. It’s a minor hassle unless the extra noise isolation is essential to you. 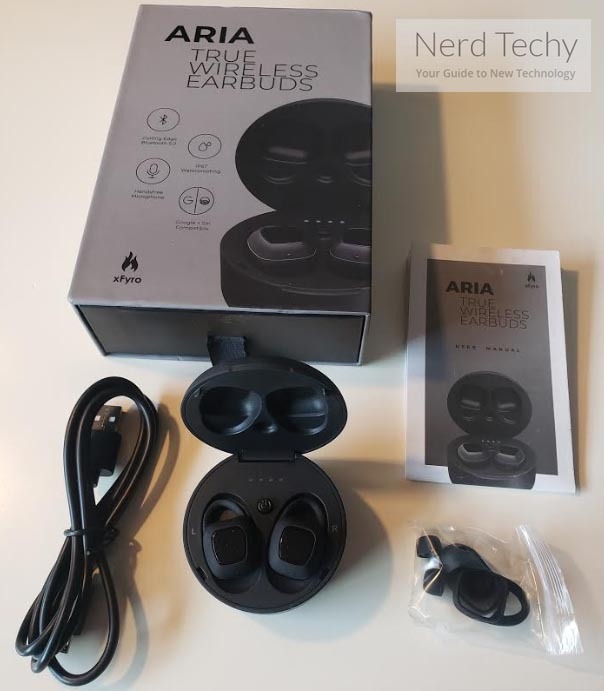 The xFyro Aria Wireless Earbuds get their wireless connection with the assistance of Bluetooth 5. That includes an EDR chip and all the modern benefits of wireless technologies. 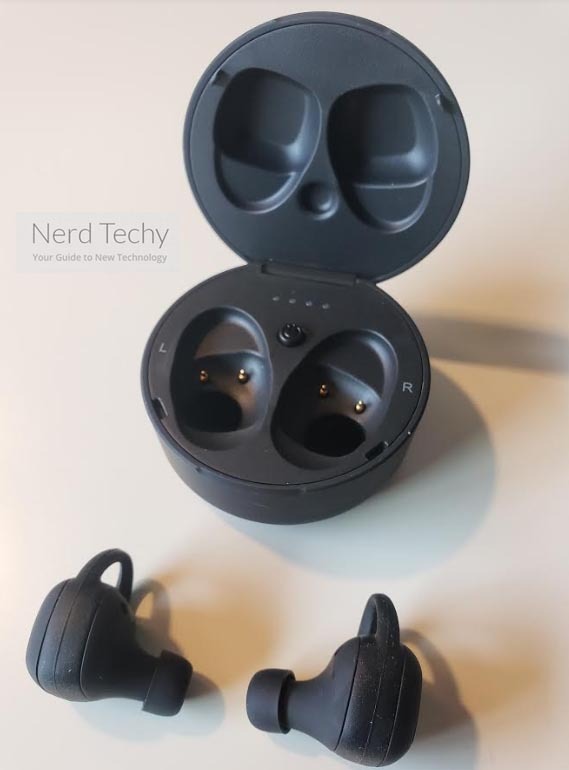 After a short period of setup, these earbuds will be able to automatically pair with each other when you remove them from their case. They’ll also remember to pair quickly with your other devices, and enjoy the battery saving benefits of the format. The only room for complaint here is that your wireless connectivity only runs about 30-feet. Pretty standard for earbuds like this, but worth keeping in mind for someone who needs more distance. The xFyro Aria Wireless Earbuds were constructed with a pretty standard Bluetooth microphone, not much to write home about. But the microphone does happen to be blessed with a couple of handy extras. That includes CVC 6.0 noise cancellation. If you’re not familiar, that tech basically works by blanketing some ambient noise against your voice, so people hear the ambiance instead of background noises around you. It’s pretty effective at shooting down around 25dB of sound. These earbuds also include some pretty remedial calling features. They allow you to answer, reject, or redial your calls. They’ll also pause your music for you when you take calls, and resume it when the call is over. Nothing special, but it’s nice to know the basics are there. In addition to the charging case, ear tips, and a user manual, the xFyro Aria Wireless Earbuds include a one-year warranty. People typically don’t have to worry too much about getting a warranty for their earbuds because these types of devices aren’t prone to high failure rates. But a little extra security is nice. Who Should Choose xFyro Aria Wireless Earbuds? 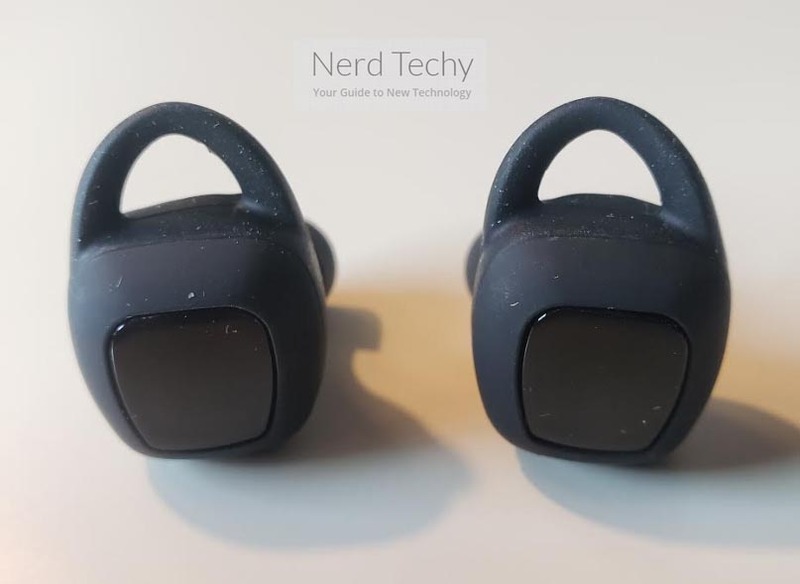 xFyro Aria Wireless Earbuds use a fairly innovative charging case, which is easily one of the most compact yet highly functional designs out there. The amazingly high portability of the case means their battery capacity suffers slightly, in some ways. But if you can look past that, these earbuds get a lot done. Their microphone goes above and beyond with CVC 6.0. With respect to audio quality, things sound pretty good. They are only marred by the absence of any extra noise cancelling technologies. Something like ANC or memory foam ear tips would have been a nice addition. But for earbuds in this price range, and for people who don’t have a reason to need extra-powerful noise isolation, Aria Wireless Earbuds are a bit of a no brainer.